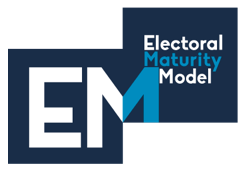 The Electoral Maturity Model (EMM) is a methodology that is being developed by a group of professionals of the electoral arena aiming at providing Electoral Authorities (EA’s) worldwide the means to assess their particular implementation of all the processes that comprise an Electoral Event, mainly from the perspective of how that implementation addresses a set of vulnerabilities that are likely to arise during execution. In the sense that vulnerabilities are identified in a way they can be applied to either automated or manual implementations. In order to provide an harmonized tool so that different implementations can be compared, the methodology needs to be based on a strong foundation. This foundation is given by a mathematical model that justifies each maturity level rating. A complete definition of the processes that comprise an Electoral event and that are the subject of the analysis. A set of quality criteria that specify the principles that need to be followed in order to guarantee a successful implementation of an Electoral event. A database of vulnerabilities, categorized by the process where they apply as well as the principles that could be compromised by their manifestation during an election. A risk rating methodology that establishes the rules to calculate the level of exposition of a particular implementation to the vulnerabilities. Once the blocks are, the focus of the methodology shifts towards the process of calculating a specific level of maturity of an Electoral event implementation, based on the risk ratings obtained. In the following posts, all these concepts and artifacts will be elaborated. Electoral Maturity Model Copyright © 2019.